Hallow Point is a 5 piece metal band out of St. Louis, MO who will roll into town next Thursday. The show is going down at Wired Pub & Grill on November 16th with support from Omaha bands 64-Hit Combo, Flourishing Illusions & My Last Request. 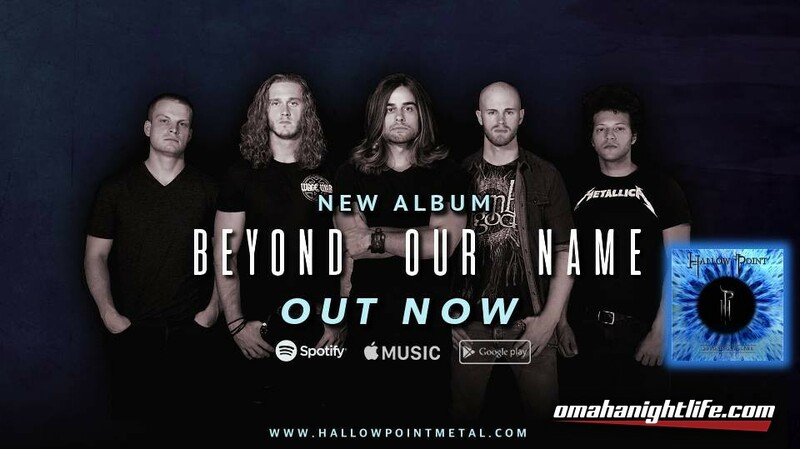 Hallow Point is touring in support of their latest EP, Beyond Our Name. I got the chance to catch up with lead guitarist Aaron Chambers the other day, talking about music, touring and the Omaha scene. Spotlight Omaha (SO): Your latest EP came out in May and you’ve been touring fairly extensively since then. Aaron Chambers (AC): Yeah, after the release, we did a little run with Final Drive out of St. Louis and following that we played a few shows throughout June & July. Since August, we’ve been trying to play just about every weekend and once a month trying to do a week long stretch in there. We all still have full time jobs and everything, trying to keep a balance in there. SO: You guys have been all over Missouri, places in Texas, North Carolina, Tennessee and Indiana. This will be the second time here in Omaha in the last couple month, both at Wired. You guys like that venue? AC: Yeah, it was fun. We played towards the end of August. That was the first time we’d gotten up there and we had a really good time. We played with a few bands from Kansas City and one band from up there, who I heard has unfortunately since disbanded. But yeah, we had a really good time up there. We’ve got a couple other bands we reached out to up there. We’re pretty much doing everything DIY right now. So we’ll reach out to the venues and reach out to local bands to see who wants to hop on. Doing anything and everything we can to promote. We got some awesome bands on it too, so we’re super stoked for that. SO: I see that most of the guys in the band, you all met in high school. With touring and being stuck in a van together, I assume it helps that you’re all pretty familiar with each other. AC: Yeah, we’re all like best friends. 3 of the guys actually went to grade school together, so they’ve been close friends for basically 20 years now. I met one in high school, we started talking and bouncing back and forth and he played guitar, he knew a couple guys who played drums and bass and it kinda evolved from there. Then it was about almost 2 years ago now, we added Brandon – who is now our bass player and singer…not the screamer, but the singer and he’s been a huge contribution to the band. He fit right in personality wise so we all get along and we’re all great buddies. It’s awesome. SO: Cool cool. Where’d the name Hallow Point come from. AC: Well, we initially had a different name, but we actually got in a bit of a legal issue with another band of the same name. They’re defunct now, but they ended up winning the name. We were kinda bummed about that, cause we were really stoked on the first name. We sat down to come up with something different. We scoured everything, the dictionary, the internet, the bible just trying to come up with any ideas or names or whatever. I came up with the idea of Hallow Point, I forget where I was looking, but it was kinda a play on words. Ya know, there’s the hollow point bullet – it’s spelled different, but when that hits it’s target it expands. We liked that concept. The main point behind it, no pun intended, was Hallow Point is something, the music, the band, it’s very important to us and we hold it near and dear to our hearts, something we really care about. So, the point of the band is important, or sacred or Hallowed – however you want to view it. Call it corny or what have you, but we are pretty happy with it. It does cause some confusion at times though – with the spelling. A lot of people like to spell it with the ‘o’. The on top of all that, Slayer has a song called “Hallowed Point” – so maybe it’s a bit of an homage to them. SO: Playing of that a bit, from your music and that homage, Slayer seems to be a bit of an influence on you guys for when you’re writing music. What are some other bands that you draw influence from. AC: Yeah. So, when we first started we were mainly just doing covers of songs in our basement, not really playing out for the first 3 or 4 years. We were doing a lot of Metallica, Megadeath, Slayer – The big four classic metal bands: Slayer, Pantera, Iron Maiden. Then we got into the new wave of American heavy metal – Lamb of God, Killswitch Engage, Trivium and now we’ve really gotten into Parkway Drive, Wage War. So we really draw from a vast variety of bands when it comes to metal. Even Avenged Sevensold, Distrubed – some of the more radio friendly metal bands – we dig those guys too. So we really just try to draw inspiration from about every source we can. I know a few of us are really into country music, some into hip-hop and rap. But when it comes to inspiration on writing, a lot of it comes from that new wave of American heavy metal. SO: On that note, when it comes to a lot of bands on the metal scene, some don’t seem to really have a lot of staying power. The ones that do, in my opinion, seem to put a lot of focus on the melodies in their music and not so much just the raw power and energy that metal can produce. It seems to me that you guys do put a lot of focus on melody and having that melodic blend to what you are putting out. It that something you think about ahead of time? Making sure you stay on point with your melodies or is it something that just comes naturally with the way you guys write? AC: I think it’s a little of both. We’re definitely very conscious of it – seeing that we love that melodic metal sound. Both the melody within the guitars and the vocals. All of us are also suckers for good hooks that catch your ear like that. So we try to really implement that in the music. But at the same time, a lot of it, because of our influences it comes naturally when we’re writing. We don’t really try to force it – like ‘that’s not melodic enough’. It really comes about organically. A lot of time we find we try to do a balance of finding a melody and also having those heavy parts so that when those heavy parts kick, they kick twice as hard cause you have the juxtaposition between heavy and melodic. SO: Any plans for a full length album coming up? AC: We don’t have any full length plans right now. Come December, we plan to start writing again. We’ll really put a heavy emphasis on that. Sometime with writing, things can go super fast or they can be like beating your head against the wall and it takes a lot longer. We’ll see how that goes. Our goal is to get as many songs together as possible. In the past, we’ve just t=done the 5 song EP. That seems to be working really well for us as far as timing goes. We definitely waited too long between our first and second EP – so we’re trying to keep the ball rolling. In this day and age, it seems people’s attention spans are a lot shorter – so it seems like you have to constantly be cranking out some kind of content to keep people interested in what you’re doing. Otherwise the next guy will come along and they’re on to something bigger, better, newer. So, we’ve been conscious of that – trying to get as many songs together as we can. So based on how that goes we may put out some singles, another EP or if we have it a full length. But for right now, we don’t have plans for a full length. SO: Omaha, this is your second time. What do you guys like about Omaha. We’ve got a pretty healthy metal scene up here – quite a few good up and coming local metal bands. What have you guys seen of the Omaha scene and what you can expect this time. AC: We only had the one local from Omaha last time and there was still a really good response and people who showed up. That was really nice and really kind of surprising for us. When you only have one local and you’re trying to get your wheels spinning and everything – you never know whether a show is going to turn out or not. From what I’ve seen from getting this show together, it seems there are a ton of really solid bands (in Omaha). Just about every band I spoke to was super helpful, super supportive. Saying ‘Yeah, I’d Love to play’. If they couldn’t play, they’d recommend other local bands or pledge to be at the show. So the sense I’ve gotten is that there is a big sense of community within the metal scene up there. To where everybody wants everybody else to succeed and to do well. I think that’s awesome and that’s what is needed to really cultivate a local scene. SO: So, is there anything exciting that you guys have planned that we can tease our readers about? I don’t want to give away anything, but anything to tease our readers about a great night to be had? AC: We do have a few things. We’ve gotten some production in our show, We have certain elements that enhance the show a bit in my opinion. I love going to see bands, but it’s always more interesting when there are other elements. We’ve synced a lot of our production to the music, so that helps to enhance the intensity of things. We really try to get up there and really put on a show and make it something they can enjoy and to come away wanting more. 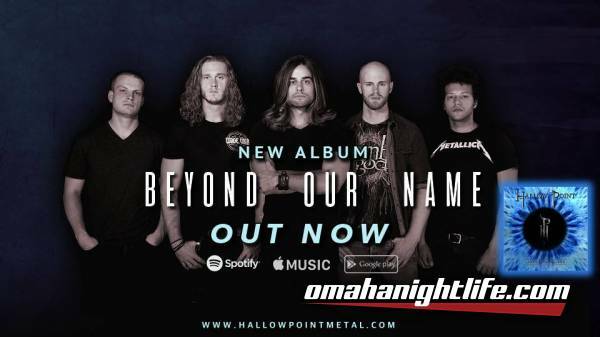 Be sure to come out to Wired Pub & Grill on Thursday to see just what Hallow Point has in store for Omaha this time around. We’ll be there, hope to see you all there as well.